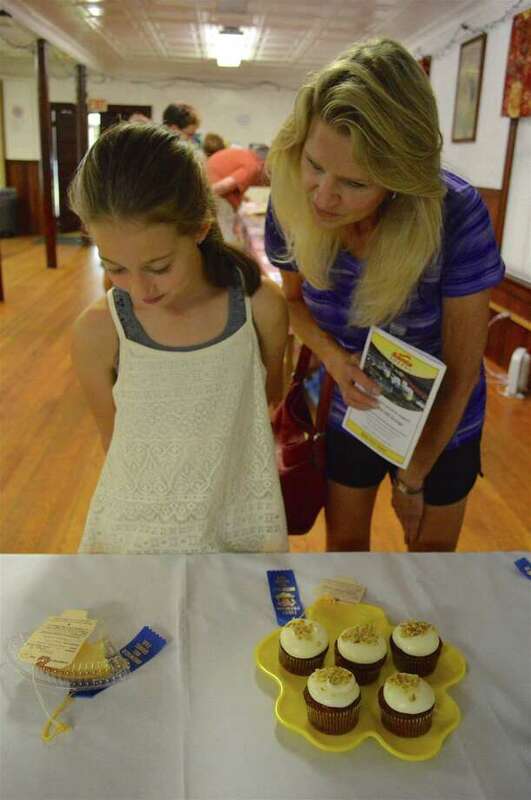 Bella Lombardi, 9, of Fairfield, and Pamela Cotter of Trumbull take a look at some prize-winning desserts at the Greenfield Hill Grange Hall Agricultural Fair, Saturday, Aug. 20, 2017, in Fairfield, Conn.
FAIRFIELD — In a tradition that’s continued for 120 years, the Greenfield Hill Grange held its annual Agricultural Fair Saturday at its historic Hillside Road hall. “Each grange has to have an agricultural fair each year,” explained Chairman Steve Golias, in order to maintain its charter and remain tax exempt. The fair featured fun games, raffles, music and food, as well as a slew of blue ribbons for displays, collections, and a cornucopia of local produce. Greenfield Hill Grange No. 133 has been at its current location since 1897, and next year will celebrate the 125th anniversary of its charter.